This animal pest alert provides information on the identification, biology, and pest potential of the common myna in Australia. The common myna or mynah (Acridotheres tristis) is also known as the Indian, Calcutta or house myna. It is not native to Australia but has established populations in eastern and south-eastern Australia, as well as other countries worldwide. The common myna has significant potential to spread further in Australia as populations are expanding south in Queensland and westwards across western Victoria and New South Wales. It is important to prevent the common myna from spreading further in Australia. The common myna is 22-27cm in length (body and tail), with a brown body, dark brown to black head, yellow bill and bare yellow skin beneath and behind the eyes. Its dark wings have prominent white patches visible in flight, it has a black tail tipped with white and long yellow legs. Male, female and immature birds all look similar. 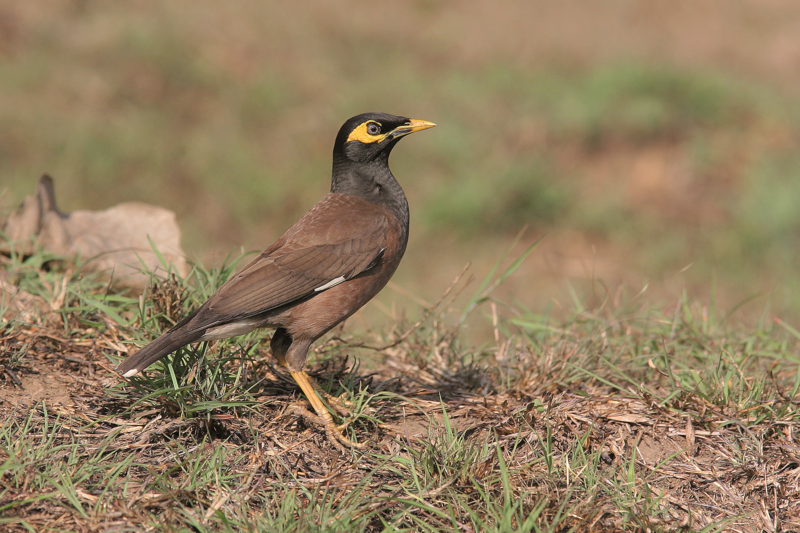 The common myna forages mostly on the ground and it has a distinctive walk or strut. The species is noisy and produces loud, raucous calls including scolding and chattering. Calls and chattering continue late into the night and begin before dawn. yellow-throated miner (all states except Tasmania).